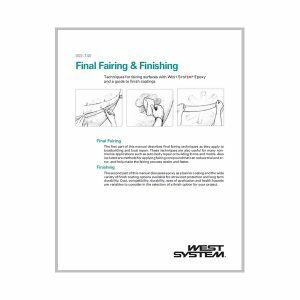 Gougeon Brothers, Inc. offers a range of detailed epoxy instruction manuals that can help you get started with WEST SYSTEM Epoxy products. All of our print publications are available below as free downloads. You’ll find print versions of most of these manuals at your local WEST SYSTEM dealer, popular online book retailers, or by contacting us. Our epoxy instruction manuals explain nearly anything you need to know about using WEST SYSTEM epoxy, whether you’re repairing a fiberglass boat, restoring a wooden boat, dealing with a case of gelcoat blisters, fairing and preparing a surface for its final finish, doing repairs around the house, trying out vacuum bagging as a clamping method, or doing repairs and projects around the house. We frequently update our epoxy instruction manuals to be sure they provide the latest products, proven techniques, and safety information. You’ll find these publications filled with clear explanations and excellent illustrations covering virtually a wide array of boat repair and home repair concerns. These epoxy instruction manuals allow us to go beyond providing our customers with a strong line of epoxy products by sharing detailed information for obtaining the best results with our marine-grade epoxies. Over the decades we’ve kept our manuals up-to-date as to reflect new product formulations, advanced epoxy testing, and the latest in best practices for epoxy use. Clear instructions, excellent illustrations, and product selection guides round out these epoxy instruction manuals. Whether your project involves fiberglass or wood, gelcoat blisters, fairing, teak decks, or installing hardware, Gougeon’s reliable publications offer you solutions. Read more about our epoxy instruction manuals and other instructional materials at Epoxyworks.